In 1995 (the days when Bryant Park Corporation was the “Bryant Park Restoration Corporation”), we launched a creative program to help raise funds for continued improvements on the park. If you’ve ever noticed the engraved bronze plaques adorning our wood and cement benches throughout the park, then you’ve seen the products of the Benchmarks Campaign. The program allowed patrons to leave a permanent mark on their favorite midtown spot, in exchange for a contribution to the Bryant Park Restoration Corporation. Along with an engraved plaque, Benchmarks Campaign members received an artistic print of “their” bench and a card granting them access to the park after closing hours to enjoy sole custody of the bench. The following excerpt from the campaign brochure explains the motivating factors for becoming a Benchmarks member. So why did we discontinue the Benchmarks Campaign? The simple answer is, we ran out of benches! A total of 37 plaques were purchased by figures in the New York City business world, celebrities of music and television, and people who just plain love the park. 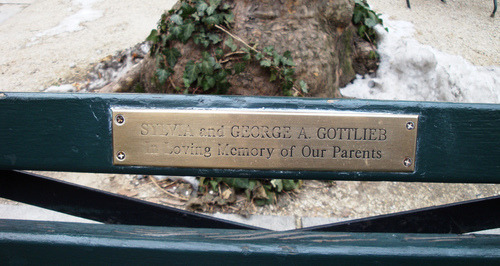 There are interesting people and stories behind many of the bench plaques (a Beatle’s wife, a mystery writer and his readers, and a New York City survival story, to name a few). Stay tuned to the blog for more.